At some places, this festival is also celebrated as Hanuman Jayanti. On this day we offer poojan to Hanumanji as our Kuldev (stands for "family deity, that is either a god or a goddess" within Hinduism) to protect us from Evil. The poojan is performed with oil, flowers, chandan and sindur. Coconuts are also offered to Hanumanji and prashad of Sesame seed, ladoos and rice with ghee and sugar. It is also remembered as the victory of Lord Krishna over the demon, Narakasura. 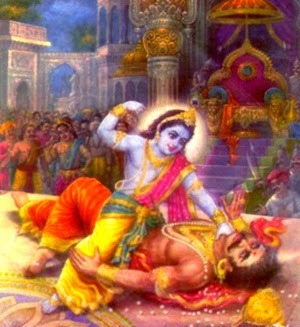 The asura (demon) Narakasura was killed on this day by Lord Krishna. 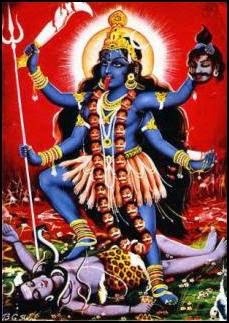 The rituals of Kali Choudas is strongly suggestive of the origin of Deepavali as an harvest festival is performed. On this day delicacies are prepared from pounded semi-cooked rice (called Poha or Pova). This rice is taken from the fresh harvest available at that time. This custom is prevalent both in rural and urban areas especially in Western India especially in Gujarat. On this day, a head wash and application of kajal in the eyes is believed to keep away the kali nazar (evil eye). Some say that those who are into tantra, learn their 'mantras' on this day. Alternatively, people offer Nived (food) to the goddess that is local to where they are originally from. This goddess is called their 'Kul Devi', in order to cast off evil spirits. Some families also offer food to their forefathers on this day. The second day of Diwali is known as Kali Choudas in Gujarat, Rajasthan & few part of Maharashtra. It is known by different names in different regions, namely – Kali Chaudas, Narak Chaudas, Narak Puja, or Roop Chaudas. However, the most well known name of this festival is Chhoti Diwali (small Diwali), as it falls a day before Diwali festival. This reverence is called "Kali Chaudas or Kal Chaturdasi". Nothing but the best for you and of you.......A very Happy Kali Chaudas to all !! !